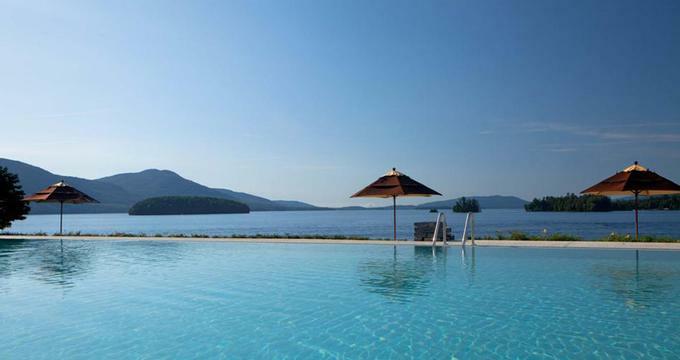 Plan a quick trip to the Sagamore on Lake George at Bolton Landing for a vacation filled with water sports and hiking in the Adirondack Mountains. This stunning resort is located on a private island four hours from NYC and Boston. The resort, originally built in 1883, is listed in the National Register of Historic Places. The Historic Hotel features 100 luxurious rooms and suites, the Lodges offers 240 rooms including 120 spacious suites with fireplaces and terraces, and the Hermitage has 10 bi-leveled suites overlooking the water. Guest rooms are furnished in Adirondack style and include modern amenities such as air conditioning, in-room cable movies and phones. The property has a par-70, 18-hole championship Donald Ross golf course, located on the mainland overlooking the lake and the Adirondack peaks. Greens Fees, including cart, start from $100 for resort guests. Transportation to the golf course is complimentary. The resort has a Tennis Club with one indoor, five outdoor tennis courts, and a racquetball court. Guests can take tennis lessons at the club on their weekend trip from New York City. The full-service health and fitness club offers various treatments ranging from facials and body wraps to Swedish massage and stone therapy. Guests can relax in the steam rooms, saunas, and whirlpools. The fitness center offers complimentary fitness classes. In the summer, there are numerous water activities to choose from, including swimming in the lake, fishing, water skiing, wind surfing, sailing and parasailing. Other nearby activities include jogging, walking, outlet shopping, as well as historical and cultural attractions. From July 1 through Labor Day, the resort offers a kid's program for children ages 4 to 12. In the winter, there is cross country skiing, ice skating, ice fishing and sledding. A complimentary daily shuttle transports guests to the nearby Gore Mountain for downhill skiing. Trillium is the resort's fine dining restaurant serving contemporary American cuisine accompanied by an extensive wine list. A more casual restaurant, Mister Brown's, serves Adirondack-inspired dishes and provides evening entertainment. The Club Grill is a New York-style steakhouse that overlooks the water. The Pool Terrace, open in the summer, offers seasonal snacks and beverages. If you are planning a romantic surprise, book a table on The Morgan, a 72-foot yacht available for lunch or dinner while cruising the waters of Lake George from May to October. Doubles from $189 per night, depending on the season. Check the hotel web site for seasonal offers, such as golf, spa and romantic packages. Book early during summer weekends and fall foliage season. In addition to the historic hotel rooms, the resort offers lodge rooms, The Castle, and condominiums. The property is a one-hour drive from Albany, a four-hour drive from New York City and Boston. Amtrak has a service from Penn Station in New York City to Albany. You can also fly to Albany, which is serviced by US Airways, Southwest, United, Delta, Nortwest and other major carriers. The airport shuttle service brings guests to the resort.